ICE Totally Gaming is the biggest business-to-business online and offline trade show of the gaming industry. 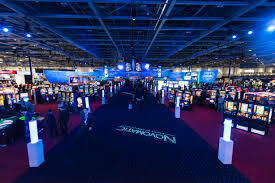 Every year in February online casino operators and game providers meet up at the ExCel centre in London to present new products, discuss new trends and attend conferences. The event covers 9 different sectors of the industry, betting, bingo, casino, lottery, mobile, sports betting, mobile and social and street. This year the event is attracting even more professional than ever and is set to break last year record of 28,487 unique visitors from 150 nations. At the moment 130 journalists and publishers have confirmed their participation and over 500 exhibitors will also be present. ICE Total Gaming truly is the world’s biggest gaming technology event and everyone is excited about the upcoming conferences, guest speaker but also the famous mingling parties. Kate Chambers, Managing Director of Clarion’s Gaming Division, said: “One of the many stand-out characteristics of ICE is the fantastic support it enjoys from the gaming industry media, who continue to make a really important contribution to the success of the ICE brand and its status as the most effective platform for gaming innovators to launch products and services to an international audience. What does it mean for the online casino players? We often see new products being released in online casinos just a few months after ICE because this tradeshow it’s a great place for casino operators and platform providers to discover independent game studios. But not only that, ICE Total Gaming is directly followed by another major online gaming event LAC (London Affiliate Conference). This conference provides a superb window of opportunity for new casinos to get know by affiliates. After this conference we often see new casino advertising.